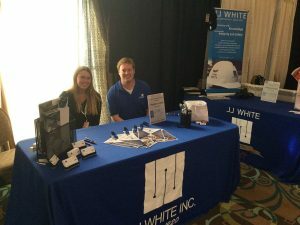 HFMADV Fall Conference and Trade Show Exhibition - J.J. White Inc.
TREVOSE, PA.- On Tuesday, October 2, the Healthcare Facility Managers Association of the Delaware Valley held their annual Fall Conference and Technical Exhibition at the Radisson Hotel. 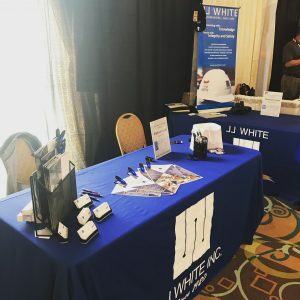 Healthcare Facilities in the neighboring areas were in attendance at the event, along with vendors from companies ranging from medical supplies to contractors. The event included three keynote speakers from The Joint Commission, MSL, and TGIG. Speakers covered topics ranging from Joint Commission updates to emergency management. Attendees were able to receive CEU credits for this event. During the classroom breaks vendors were able to mingle with attendees to discuss business opportunities or thank one another for the continued business. JJ White has h eld a platinum sponsorship at this event for the past seven years. This included, the company logo being displayed on conference signs and handout materials. 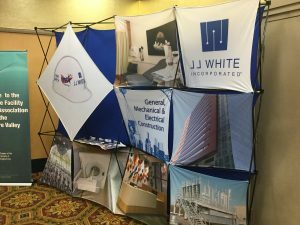 In addition to this, JJ white Inc. is now featured on the HFMADV website, strengthening the company’s bonds with the healthcare industry. JJ White came fully prepared with members from the business development and marketing team, along with the HVAC services team. After the event, JJ White awarded an attendee with four tickets to a Flyer’s game in our Club Box Seats.